A suicide bombing at a funeral in the Pakistan city of Quetta kills 31 people. 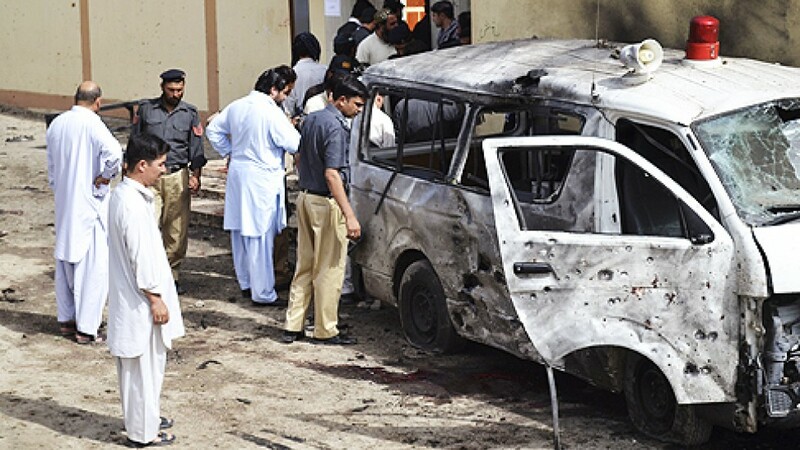 On 8 August 2013, a suicide attacker exploded a bomb at a funeral being held for a police officer in Quetta, Pakistan, and killed as many as thirty-one people and injured over fifty people. No group has taken responsibility for the bombing, but it is believed by whom? that the Taliban were behind the bombing. A senior police officer, Fayaz Sumbal, noticed the suicide bomber before he blew himself up. As Fayaz began searching the suicide bomber’s body, the bomber blew himself up. The bomber was wearing a jacket that had ball bearings and shrapnel inside. Witness said that in the immediate aftermath of the attack weeping policemen wandered among the blood and body parts, looking for colleagues or sat, shocked and in silence, amid abandoned shoes and other belongings. Policeman Mohammad Hafiz told the AFP news agency of his horror after the bomber – wearing a jacket packed with ball bearings and shrapnel – detonated his device. “I was inside the mosque and we were lining up for the funeral prayers when a big blast took place,” he said. “I came out and saw injured and dead bodies lying on the ground. 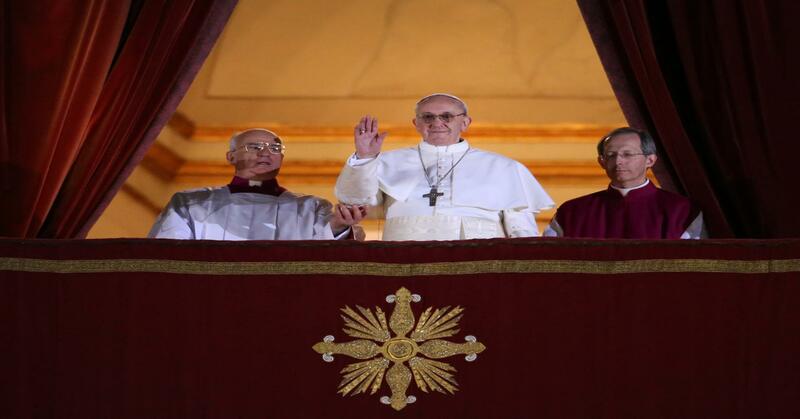 Pope Francis is elected as the 266th Pope of the Catholic Church. Bergoglio was elected pope on 13 March 2013, the second day of the 2013 papal conclave, taking the papal name Francis. Francis was elected on the fifth ballot of the conclave. The Habemus Papam was delivered by Cardinal protodeacon Jean-Louis Tauran. Cardinal Christoph Schönborn later said that Bergoglio was elected following two supernatural signs, one in the conclave and hence confidential, and a Latin-American couple of friends of Schönborn who whispered Bergoglio’s name in Schönborn’s ear; Schönborn commented “if these people say Bergoglio, that’s an indication of the Holy Spirit”. Instead of accepting his cardinals’ congratulations while seated on the papal throne, Francis received them standing, reportedly an immediate sign of a changing approach to formalities at the Vatican. During his first appearance as pontiff on the balcony of Saint Peter’s Basilica, he wore a white cassock, not the red, ermine-trimmed mozzetta used by previous popes. He also wore the same iron pectoral cross that he had worn as Archbishop of Buenos Aires, rather than the gold one worn by his predecessors. After being elected and choosing his name, his first act was bestowing the Urbi et Orbi blessing to thousands of pilgrims gathered in St. Peter’s Square. Before blessing the crowd, he asked those in St. Peter’s Square to pray for his predecessor, “the bishop emeritus of Rome” Pope Benedict XVI, and for himself as the new “bishop of Rome”. Pope Francis held his papal inauguration on 19 March 2013 in St. Peter’s Square in the Vatican. He celebrated Mass in the presence of various political and religious leaders from around the world. In his homily Pope Francis focused on the Solemnity of Saint Joseph, the liturgical day on which the Mass was celebrated. This is the first time that a pope has been named Francis. On the day of his election, the Vatican clarified that his official papal name was “Francis”, not “Francis I”, i.e. no regnal number is used for him. A Vatican spokesman said that the name would become Francis I if and when there is a Francis II. It is the first time since Pope Lando’s 913–914 reign that a serving pope holds a name not used by a predecessor. Francis also said that some cardinal-electors had jokingly suggested to him that he should choose either “Adrian”, since Pope Adrian VI had been a reformer of the church, or “Clement” to settle the score with Pope Clement XIV, who had suppressed the Jesuit order. In February 2014, it was reported that Bergoglio, had he been elected in 2005, would have chosen the pontifical name of “John XXIV” in honor of Pope John XXIII. It was said that he told Cardinal Francesco Marchisano: “John, I would have called myself John, like the Good Pope; I would have been completely inspired by him”. On 16 March 2013, Pope Francis asked all those in senior positions of the Roman Curia to provisionally continue in office. He named Alfred Xuereb as his personal secretary. On 6 April he named José Rodríguez Carballo as secretary for the Congregation for Institutes of Consecrated Life and Societies of Apostolic Life, a position that had been vacant for several months. Francis abolished the bonuses paid to Vatican employees upon the election of a new pope, amounting to several million Euros, opting instead to donate the money to charity. He also abolished the €25,000 annual bonus paid to the cardinals serving on the Board of Supervisors for the Vatican bank. On 13 April 2013, he named eight cardinals to a new Council of Cardinal Advisers to advise him on revising the organizational structure of the Roman Curia. The group included several known as critics of Vatican operations and only one member of the Curia. They are Giuseppe Bertello, president of the Vatican City State governorate; Francisco Javier Errazuriz Ossa from Chile; Oswald Gracias from India; Reinhard Marx from Germany; Laurent Monsengwo Pasinya from the Democratic Republic of the Congo; George Pell from Australia; Seán O’Malley from the United States; and Oscar Andres Rodriguez Maradiaga from Honduras. He appointed Bishop Marcello Semeraro secretary for the group and scheduled its first meeting for 1–3 October. A hot air balloon crashes in Egypt, killing 19 people. 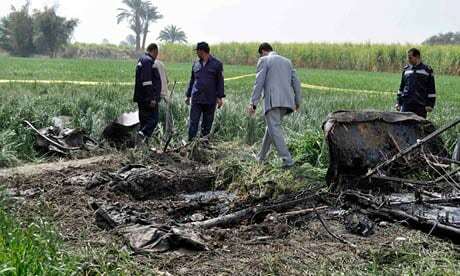 On 26 February 2013, at 07:00 Egypt Standard Time (05:00 UTC), a hot air balloon crashed near Luxor, Egypt. The crash resulted in 19 deaths out of 21 passengers – 18 on-site and one in hospital hours later. It is the deadliest ballooning accident in history and the deadliest aerostat disaster since the Hindenburg disaster in 1937 which killed 36 people. Hot air balloons are commonly used in Egypt to provide tourists with an aerial view of the country’s landscape and famous landmarks. In Luxor, such rides offer views of the Nile River, the temple of Karnak, and the Valley of the Kings, among other attractions. Concerns over passenger safety have been raised from time to time, with multiple crashes reported in 2007, 2008 and 2009. In April 2009, 16 people were hurt when a balloon crashed during a tour of Luxor. After the crash, flights were grounded for six months while safety measures were improved. Pilot training was increased and balloons were given a designated landing zone. Following the toppling of Hosni Mubarak in 2011, the rule of law has largely been ignored. Sky Cruise, the operator of the balloon, had suffered a previous accident in October 2011, which even involved the same balloon. The company has stated that it is properly insured and prepared to compensate victims’ families. Early on 26 February, an Ultramagic N-425 balloon, registration SU-283, operated by Sky Cruise departed on a sight-seeing flight carrying twenty passengers and a pilot. According to a nearby balloon pilot, Mohamed Youssef, a fire started in the Sky Cruise balloon a few meters off the ground as it was attempting to land, as a result of a leaking fuel line. As the fire engulfed the basket, the pilot and one passenger leaped to safety as the craft rose rapidly aided by a wind gust. As the balloon rose, approximately seven passengers jumped to their deaths to escape the fire. At an altitude of approximately 300 meters, there was an explosion which could be heard several kilometers away. The balloon and remaining passengers plunged to the ground, killing everyone remaining on board. One eyewitness remarked that he heard “a huge bang. It was a frightening bang, even though it was several kilometers away” from his location. Youssef said it appeared that a gas leak in one of the balloon’s tanks caused the fire and resulting explosion, consistent with information reported in state-run media. Earlier reports had indicated that the balloon may have contacted a power line. Two minutes later, the burning craft crashed into a sugar cane field west of Luxor. A second explosion was reported 15 seconds later. Ambulances arrived on the scene after 15 minutes. Bodies were scattered across the field when rescue workers arrived on the scene. The balloon’s final moments were caught on amateur video. At the time of its ascent, the balloon carried 20 passengers and Momin Murad, the balloon’s Egyptian pilot. Nineteen of the passengers were tourists: nine from Hong Kong, four from Japan, three from Britain, two from France, and one from Hungary; the 20th passenger was an Egyptian tour guide. Of the Hong Kongers, five were women and four were men. They were members of three families on a tour group organized by Kuoni Travel. The Japanese victims were two couples from Tokyo in their 60s. They were on a ten-day tour of Egypt organized by JTB Corporation. The three Britons and the Hungarian-born passenger, a resident of the UK, were on a tour organized by Thomas Cook Group. The French victims were a 48-year-old woman and her 14-year-old daughter. The accident killed 18 of the passengers on site; the pilot and two passengers survived the initial crash. The two surviving passengers, both British men, were rushed to hospital in critical condition. One of them died after five hours of surgery. Dr. Mohammad Abdullah, the head of the emergency ward of the Luxor hospital, said that the Briton who died in the hospital had probably suffered a 50-meter fall. The surviving Briton was described as being in critical but stable condition, while the pilot was said to be conscious and talking, but with burns covering 70% of his body. Doctors at the Luxor International Hospital said that many of the dead suffered severe internal injuries and severe burns. After news of the tragedy broke, Governor of Luxor Ezzat Saad banned hot air balloon flights in his jurisdiction until further notice. Egypt’s civil aviation minister, Wael el-Maadawi, followed by suspending balloon flights nationwide. In a statement, President Mohamed Morsi expressed his “deepest condolences and sympathy for the families of those who lost their lives in this tragic incident.” National government spokesman Alaa Hadidi said a committee would be formed to investigate the accident. The bodies of the victims were transported to four hospitals in Cairo. Chinese consular officials in the Arab Republic of Egypt and Hong Kong Immigration Department officers were scheduled to travel with the family members of the Hong Kong victims to Cairo. Kuoni Travel, the Hong Kong travel agency that organized the tour attended by the Hong Kong passengers, made plans for the six tour members who did not take the balloon ride to leave Egypt. The tour agency stated that, in addition to the US$7000 per person stipulated by contract, additional compensation would be given. Mohammed Osman, head of the Luxor Tourism Chamber, accused civil aviation authorities of lowering standards prior to the accident. “I don’t want to blame the revolution for everything, but the laxness started with the revolution,” he said. “These people are not doing their job, they are not checking the balloons and they just issue the licenses without inspection.” National authorities were quick to deny the allegations, noting that the balloon had recently been inspected. They also said the pilot should have shut off gas valves and attempted to put out the fire instead of bailing, and thus may have contributed to the tragedy. An anonymous civil aviation ministry official acknowledged to the press that standards had been weakened by the current regime. The pilot’s license had been renewed one month prior to the accident. Local and foreign media analysts speculated that the crash would hurt Egypt’s already weakened tourism industry, which was down 22% from 2010 levels. Wael Ibrahim, who oversees the tourism syndicate in Luxor, did not expect the accident to worsen the situation since tourism was already down so much. “This accident could happen anywhere in the world”, he remarked. A local balloon operator, angered by the industry shutdown, remarked: “Why the mass punishment? Do you stop all flights when you have a plane crash? … You will cut the livelihoods for nearly 3,000 human beings who live on this kind of tourism.” Angered by the industry-wide shutdown, tourism workers threatened to organize protests on 2 March. The same day, Saad admitted that pressure to resume balloon flights was mounting and promised that downtime would be less than a month. Hot air balloon rides at Luxor were set to resume in April, according to a statement on the Egyptian Civil Aviation Regulatory Commission’s website. Preliminary results of the government investigation ruled out criminal conduct as the cause of the crash. On 2 March, Luxor-area balloon pilots held a press conference to defend Egypt’s safety protocol and their colleague’s actions. The Egyptian Civil Aviation Authority released its final report of the crash on 7 January 2014. The 219-page report blamed a leak in a fuel line connected to the balloon’s burner. The aging line had been in use since 2005 and sprung a leak, which ignited as the balloon came in to land. The fire severely injured the pilot, who jumped or fell from the basket. Some of the ground crew released the ground line in order to attend to the pilot, so that the remaining crew could not keep the balloon near the ground. The flaming balloon rose rapidly and uncontrolled, then exploded. The balloon’s pilot and a maintenance engineer were arrested for negligence. 19 firefighters die while fighting a wildfire in Yarnell, Arizona. 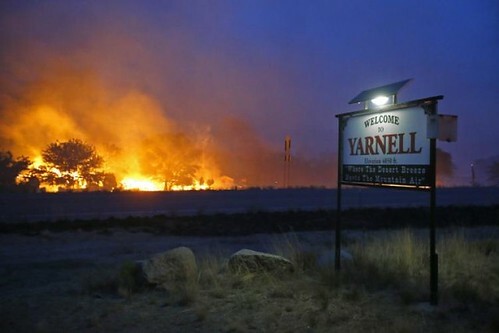 The Yarnell Hill Fire was a wildfire near Yarnell, Arizona, ignited by lightning on June 28, 2013. On June 30, it overran and killed 19 City of Prescott firefighters, members of the Granite Mountain Hotshots. It was the deadliest U.S. wildfire since the 1991 East Bay Hills fire, which killed 25 people; the deadliest wildland fire for U.S. firefighters since the 1933 Griffith Park Fire, which killed 29; and the deadliest incident of any kind for U.S. firefighters since the September 11, 2001, attacks, which killed 343. It is the sixth-deadliest American firefighter disaster overall and the deadliest wildfire ever in Arizona. At 5:36 p.m. MST on June 28, 2013, lightning ignited a wildfire on BLM lands near Yarnell, Arizona, a town of approximately 700 residents about eighty miles northwest of Phoenix. On June 30, strong winds reaching more than 22 mph (35 km/h), pushed the fire from 300 acres to over 2,000 acres.A long-term drought affecting the area contributed to the fire’s rapid spread and erratic behavior, as did temperatures of 101 °F (38 °C). By July 1 the fire had grown to over 8,300 acres and prompted the evacuation of the nearby community of Peeples Valley.The fire was still completely uncontrolled, with more than 400 firefighters on the line. On July 2 the fire was estimated at 8 percent containment and had not grown in the past 24 hours. By the end of the day on July 3, the fire was reportedly 45 percent contained and not growing thus allowing Peeples Valley residents to return to their homes on July 4.Four days later on July 8 residents of Yarnell were permitted to return. The fire was declared 100 percent contained on July 10. The Yavapai County Sheriff’s Office said that 127 buildings in Yarnell and two in Peeples Valley had been destroyed. A “flash point” of the fire was the Glen Ilah neighborhood of Yarnell where fewer than half of the structures were burned. The suspect in the Boston Marathon bombing, Tamerlan Tsarnaev, is killed in a shootout with police. An investigation involving more than 1,000 federal, state and local law enforcement personnel quickly was launched. A breakthrough in the case came less than two days later, when FBI analysts, who had pored through thousands of videos and photographs taken from security cameras in the area where the attack occurred, pinpointed two male suspects. The FBI released surveillance-camera images of the men, whose identities were then unknown, on the evening of April 18. That night at around 10:30, Sean Collier, a 27-year-old police officer at the Massachusetts Institute of Technology, was shot dead in his patrol car on the school’s Cambridge campus. Authorities later would link the murder to the Tsarnaev brothers, who allegedly attempted to steal the officer’s service weapon. Soon after Collier was killed, Tamerlan Tsarnaev allegedly carjacked a Mercedes SUV at gunpoint, taking the driver hostage and telling him he was one of the Boston Marathon bombers. 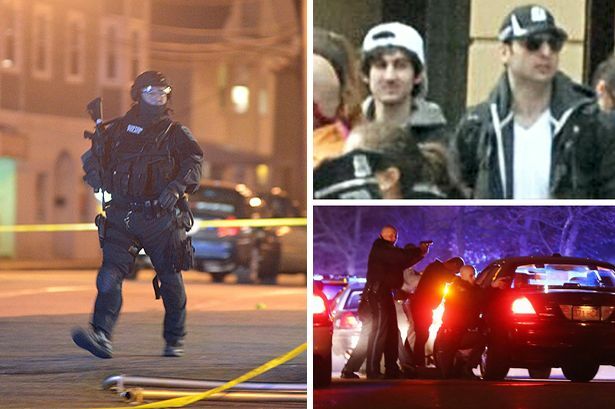 Dzhokhar Tsarnaev followed behind in a Honda Civic before joining his older brother and the hostage in the SUV. The brothers drove around the Boston area with their hostage, forcing him to withdraw money from an ATM and discussing driving to New York City. When they stopped at a Cambridge gas station, the hostage escaped and called police, informing them the SUV could be tracked by his cellphone, which was still in the vehicle. Shortly after midnight, police in the Boston suburb of Watertown spotted the suspects in the stolen SUV and Honda Civic and tried to apprehend them. A gun battle broke out on a Watertown street, with the Tsarnaevs exchanging fire with the police and hurling explosive devices at them. One officer was seriously injured by gunshots but survived. After Tamerlan Tsarnaev was tackled by police, Dzhokhar Tsarnaev drove the stolen SUV straight at them, running over his brother before speeding away. He abandoned the SUV nearby then fled on foot. A gravely wounded Tamerlan Tsarnaev, whose body was riddled with bullets, was taken to a hospital, where doctors were unable to resuscitate him. Mass protests start in Egypt. Nik Wallenda walks across the Grand Canyon on a tight rope. The social media monitoring site, Klout passes 1 million perks. The first post is made on the blog Running Research Junkie.